The Model VM136 Exhaust Vent Cap is a white PVC cap with three louvers designed to terminate the central vacuum’s exhaust system. The exhaust system routes the exhaust air from the central vacuum power unit to outside the residence. When the central vacuum system is off the vent cap’s louvers are closed, preventing rain and insects from entering the exhaust system. When the central vacuum system is running, the louvers automatically open to pass the exhaust air to the outside. 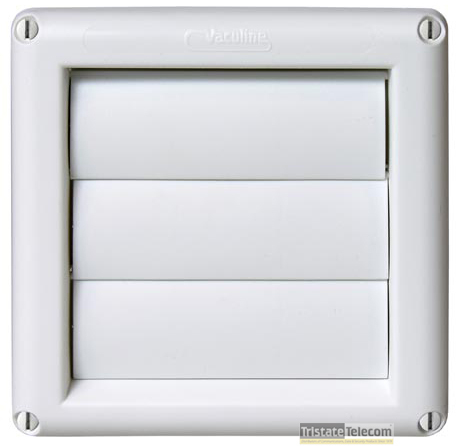 The exhaust vent cap mounts to the wall with four screws and connects to the system’s steel or PVC exhaust tubing.